Habit: Blooms white to near white all growing season. Crow poison looks much like wild onion but does not have the onion smell. This early spring to fall flower is one of the first to appear on lawns, meadows, or roadsides throughout much of the country. It grows from a bulb and looks much like the wild onion, but has fewer and larger flowers on long stems and lacks the onion odor. The leaves are all at the base of the plant, about 1/8 inch wide, but often quite long, 4–15 inches. 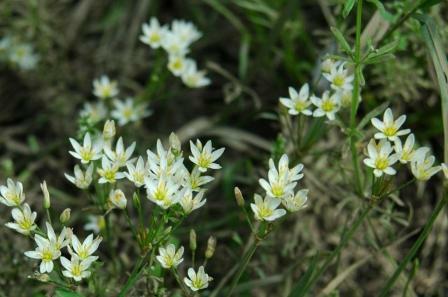 The white flowers have 6 petals with a green to brown stripe, and 6 stamens. Individual flowers are ½ - 1 inch across and grow in loose clusters on stalks 8–16 inches tall. It is an upright perennial with a white flower about 1 inch in diameter and consists of six petals. Native Habitat: Lawns, disturbed areas, open slopes, roadsides, prairies, and open woodlands. Found in various soils from sand to clay. It grows in most soil types and blooms in the spring and the fall. Notes: This plant may be considered a protected species; check before digging or gathering seeds. Suitable for growing in containers. This plant is mildly poisonous and should not be tasted. Wild onion that looks almost the same has a strong onion fragrance when crushed; crow poison does not. Control with soil improvement and organic herbicides.